This article and compiled statistics is guest blogged by Ian Graham. 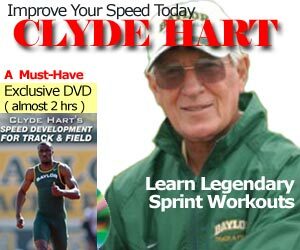 Click here for Part 1 of the article Was Carl Lewis Right about the Long Jump being Pathetic? Below is a chart of all the number of 27 foot, 28 foot and 29 foot jumpers per year over the last 40 years (1976 – 2015). All based on outdoor wind-legal yearly ranking lists. 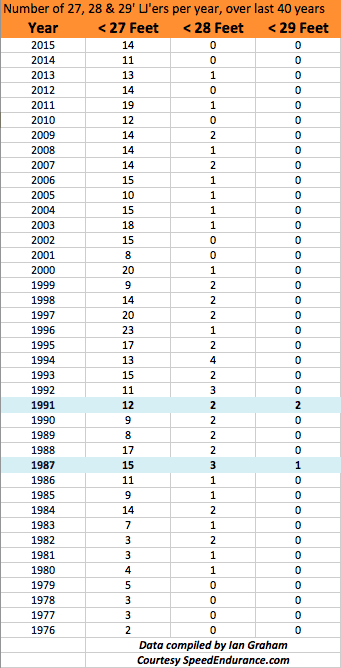 From 1980-2000 we had at least 1 or more jumpers per year over 28 feet, with the most 28 foot jumpers coming in 1994 with 4 athletes in the 28 foot club. Since 2001 we’ve had 6 of 15 seasons in which we’ve had no 28 foot jumpers. In 1976 there was only 2 men over 27 feet. That number peaked at 23 athletes 20 years later in 1996. The first 27 foot jump came in 1961 by Ralph Boston. Then the first 28 foot and 29 foot jump came in 1968 by Bob Beamon. 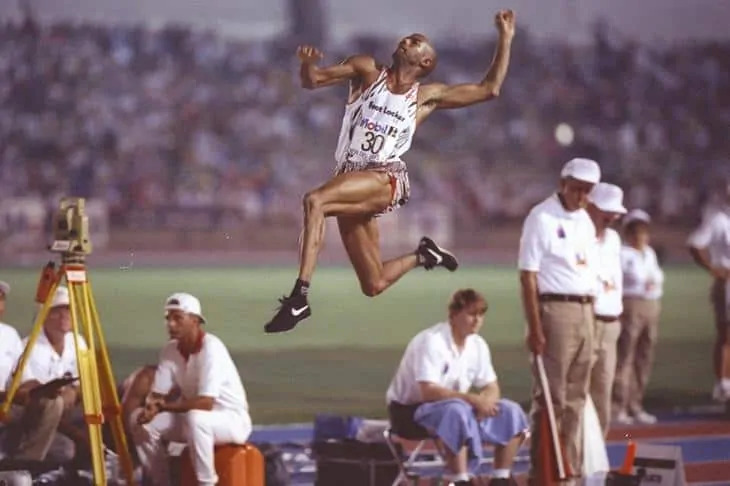 The next 29 foot jump came in 1987 by Robert Emmiyan. Then 4 years later we’d have the first competition with 2 men going over 29 feet in Tokyo, Japan at the 1991 world championships. 1968 = 1st 29 foot jump. We then waited 19 years for the next 29 foot jump. Then 4 years later (1991) we had another two 29 foot jumps. It’s now almost 25 years since we last seeing a 29 foot jump. Who’ll be next to jump 29 feet? READ NFL Lockout Update: Chris Johnson Wants to Run Track?